When a business selling church supplies UK wide and abroad needed some eye catching custom hangers produced, they found us online and got in touch. Working to their brief, we produced some beautiful dark wood hangers printed with their logo in gold, creating an appropriately elegant product for their business. Here’s how we did it. 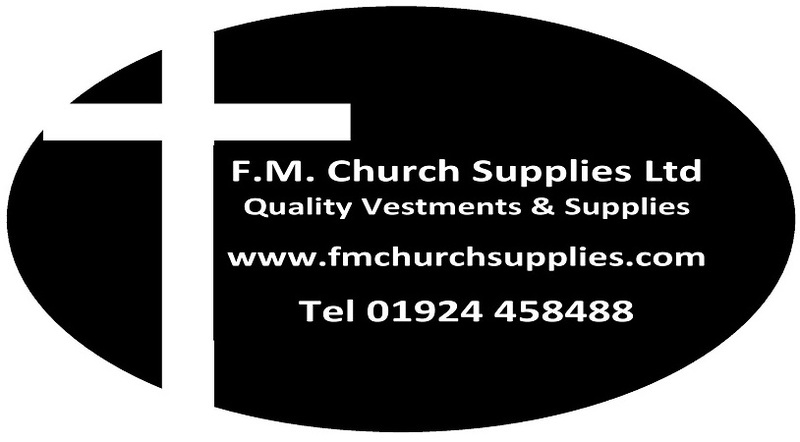 Based in the UK, FM Church Supplies are a leading provider of all church supplies UK wide and overseas too. They provide everything churches need to operate, including communion wafers, vestments, brassware, silverware and much more. FM Church Supplies were looking for a company to produce 200 custom logo hangers for their business. When they supplied bespoke vestments, cassocks and other items for their customers, they wanted to present them on bespoke clothes hangers to boost their brand recognition and give their products a professional touch. They came to us for support with this project. Hanger style: Our client knew they wanted to be able to use these hangers for a variety of items, so we suggested a jacket hanger with trouser bar and notches for added hanging options. Hanger material: The client had expressed a preference for dark wood hangers, so we advised using these gorgeous walnut coat hangers which are rich and beautiful, as well as highly durable. Logo printing: The client’s logo was supplied to us in high resolution format in plain black and white. We discussed colours with the customer, and between us we decided that a gold print would look amazing on these dark wood hangers and would be complemented perfectly with the brass hanging hook. Printing process: When printing custom logo hangers, we know that it’s not only important to get the print perfect, it’s also crucial to ensure it is colourfast. Our PAD printing process guarantees no ink will transfer to the garments. We completed this order for our client in plenty of time for their deadline and shipped these beautiful walnut coat hangers directly to them. We think you’ll agree that these hangers look absolutely beautiful. The gold print contrasts beautifully against the walnut of the hanger, and the little brass hanging hook really complements everything well. Our client was over the moon and is keen to reorder once they’ve used up their stock. If you’re interested in creating bespoke clothes hangers for your business, talk to our team about your options. We can supply printed coat hangers in a range of materials and styles, working to your specifications to create something truly unique. Give us a call today and let us help you design something special for your store.